Record drawing showing two putti holding a garland over their shoulders; behind them is a relief showing two figures carrying off a third figure in a quadriga. 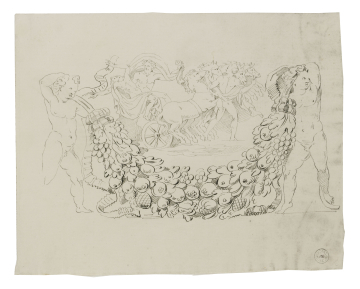 You are here: CollectionsOnline / Record drawing showing two putti holding a garland over their shoulders; behind them is a relief showing two figures carrying off a third figure in a quadriga. This drawing may be taken from a sarcophagus or altar relief; the use of putti to frame a mythological vignette was fairly common in antiquity. Several examples are illustrated in G. B. Piranesi, Vasi, Candelabri, Cippi, Sarcofagi, etc. (Rome, 1778). The unimpressive draughtsmanship here is similar to that found in Adam vol.26/171.